Our 3.4" X 5.8" laminated pocket medical cards fit perfectly in a scrubs or lab coat pocket and provide the most important information on specific topics in a clear and concise manner. These practical, sturdy, easy-to-read reference cards are a must for the medical professional or interested lay person. 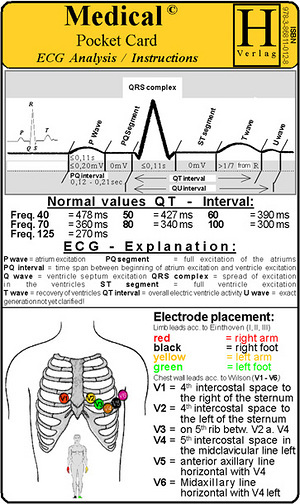 The ECG Analysis/Instruction card includes normal values for QRS-Complex and QT-Intervals, an ECG explanation, instructions for placement of electrodes and special leads V7-V9 and Nehb leads, as well as ECG changes/disturbances.